An event that passed with very little comment this summer was the naming of the first of the Royal Navy’s two 65,000-ton aircraft carriers—HMS Queen Elizabeth—at it launching ceremony in Rosyth. It is the second warship so named in RN service. Its illustrious predecessor was the name ship of a class of five fast battleships completed during WWI. That 15-inch-gun ‘battlewagon’ gave sterling service in WW2 before being broken up at the Inverkeithing yard in the late 1940s not a mile from where the new ship now lies. Massive and impressive though the new ship and its engineering may be, the normal delay for fitting out so any ship can be commissioned is, in this case, further delayed by problems with the sole reason for a ship such as this—aircraft. 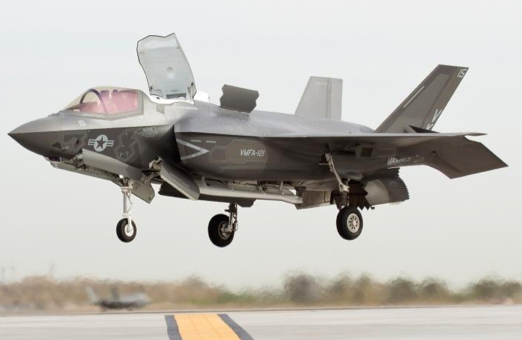 Originally planned by the previous Labour government to fly the new American Lockheed Martin ‘Joint Strike Fighter’ (JSF) in its ‘jump-jet/STOL’ configuration (the F-35B), the MoD’s Strategic Defence Review of the carriers belatedly realised that the navalised version (the F-35C) would be the more cost-effective choice of aircraft. Although not able to take off and land in the confined space of the F-35B, the F-35C was designed from the start as the carrier variant: it has a larger internal weapon bay to carry a bigger punch and would be cheaper in the long run, reducing “through-life costs by around 25%”. The F-35C has larger wings and more robust landing gear than the other variants, making it suitable for catapult launches and fly-in arrestments aboard full-scale aircraft carriers. Its wingtips also fold to allow for more room on the carrier’s deck while deployed. The F-35C also has the greatest internal fuel capacity of the three F-35 variants, carrying nearly 20,000 pounds of internal fuel for longer range and better persistence than any other fighter in a combat configuration. As a result, US Navy orders are for F-35Cs for their dozen operational carriers; F-35B orders are all (other than the RN batch) from the US Marine Corps to replace their AV8 Harriers and designed to operate from austere (i.e. small) bases and air-capable ships near front-line combat zones. But using the carrier variant requires catapults and arrester wires to launch and land aircraft from the deck. Despite meaning that this would then enable both carriers to launch and land American, French and other allies’ naval aviation, the redesign and rebuild of the carriers necessary at that late stage would have added another £2bn to the existing £6bn program costs and delayed completion of even the first carrier to 2027. So the decision was taken to continue with the F-35B. This means tactical air operation aboard the carrier will be very similar to the now-scrapped Illustrious class small carriers that used to fly Harriers. This also explains the prominent ‘ski-jump’ launching ramp repeated on the bows of both new carriers. But the the delay to equipping the carriers is as much due to delays in the more complicated F-35B (its Rolls-Royce patented shaft-driven LiftFan engine is showing teething troubles) as it is to the MoD being strapped for cash and delaying expenditure. Whatever the cause, it did not appear at the Farnborough Air Show (again) this year and the first of 48 aircraft at £70m a pop will not deploy on the carrier until 2020—three years after planned commission. Undoubtedly a powerful unit once equipped, trained and deployed, Britain’s declining ability to project power globally begs the question why such a ship is necessary. There is also the small matter of vulnerability. As a Soviet submarine commander once quipped during a NATO visit: “You know what we call carriers? Targets!“. This entry was posted in Politics and tagged carrier; F-35;. Bookmark the permalink.